June 10, 2018: Hello summer! A time for travel, sand and sea – and also a time for additional TLC when it comes to haircare. It’s no secret that the Middle East’s scorching summer temperatures can take a significant toll on both the quality and appearance of our hair. Synonymous with the triggers of hair damage – UV Rays, saltwater and humidity – summertime can render our locks dry, brittle and frizzy. Holiday time is also a time to let your hair down, and when you do, you’ll want to know that your hair smells as good as it feels. In fact, when it comes to feeling clean and fresh, studies show that our sense of smell is hard wired into our limbic system, meaning that a fresh scent alone can trigger a feeling of cleanliness and invigoration, so it doesn’t come as a great surprise that most of us love the smell of beautiful, freshly washed hair. Head & Shoulders helps on both fronts with a collection of fast working and great smelling shampoos and conditioners. With six times more moisture than ordinary shampoos, it is one haircare product that deeply nourishes your locks for softer summer hair that can withstand the sunniest days. Additionally, Head & Shoulders is specially formulated to clear dandruff and keep it under control, while also keeping hair smelling fresh and clean. Not only does the scent last through washing and blow-drying, it continues to linger even after styling it, and well into the day. This summer, trust a product that has kept millions of men and women happy throughout the year – it delivers unbeatably clean and freshly fragranced hair that looks and smells so good. 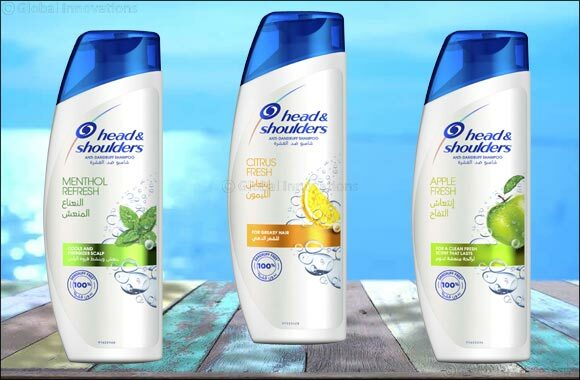 Head and Shoulders comes in exciting and invigorating scents to match your mood including Menthol Fresh, Apple Fresh and Citrus Fresh.